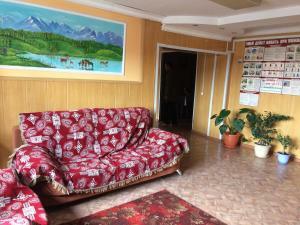 A-HOTEL.com - Luxury and cheap accommodation in Kosh-Agach, Russia. Prices and hotel, apartment booking in Kosh-Agach and surrounding. This indicative offer was derived from the most recently booked accommodation in Kosh-Agach and sort by the price, from cheapest Kosh-Agach accommodation to the most expensive hotels. To select accommodation by your preferences we recommend to choose from 4 accommodation offers in Kosh-Agach in total. By entering the dates of your overnight stay in Kosh-Agach and using the filter tools you can sort the best possible accommodation for you. The entered dates of your stay are crucial for the most accurate offer as it derives all the online information on pricing and availability of Kosh-Agach accommodation. Then you can book the selected Kosh-Agach lodging (hotels, apartments etc.) immediately. Located in Kosh-Agach, Vizit-tsentr Sailugemskiy features free WiFi. All rooms feature a kitchen and a private bathroom. Guest house National Park Saylyugemskiy offers accommodation 40 km from Kosh-Agach. Free private parking is available on site. Guest House Centralnaya offers pet-friendly accommodation in Kosh-Agach. Free WiFi is offered and free private parking is available on site. Located in Kosh-Agach, Fermerskiy Dom v Kosh-Agache provides accommodation with a flat-screen TV and a kitchen. Complimentary WiFi is featured. Tashantinskiy Hotel offers accommodation in Tashanta. All rooms boast a flat-screen TV with satellite channels and a private bathroom. Vacation homes Shavlo features accommodation with a terrace and free WiFi. Guests wishing to travel lightly can make use of towels and linens for an additional supplement.